The Salomon QST Myriad 85 allows you to ski on piste with confidence but gives you the option of skiing the whole mountain with ease. Being 85mm wide, it’s the perfect waist width to use both on piste and also off in the softer snow. 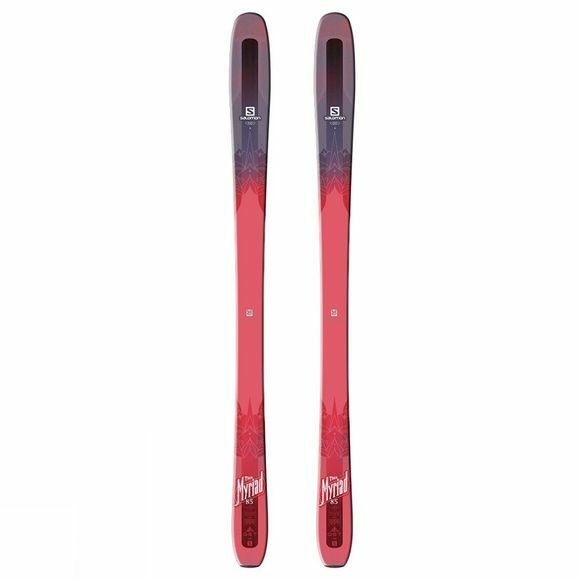 This ski has superior underfoot performance for hard pack carving, It’s also quick and agile due to its All-terrain rocker, which will also allow for greater flotation in the softer snow. Other Features: Pulse Pad- A layer of rubber all along the edges and in critical zones of the ski for smoother ride & improved ski-snow contact. Koroyd Tip - More Float, Less FLop. Super light honeycomb/Koroyd Tip insert, reinforced with ABS. Less weight at the extremities with increased dampening from Koroyd dramatically increases manoeuvrability and ease of steering on rockered skis.